San Francisco's Techno-Activism Third Mondays shifts 24 hours into the (hopefully not too dystopian) future this week. 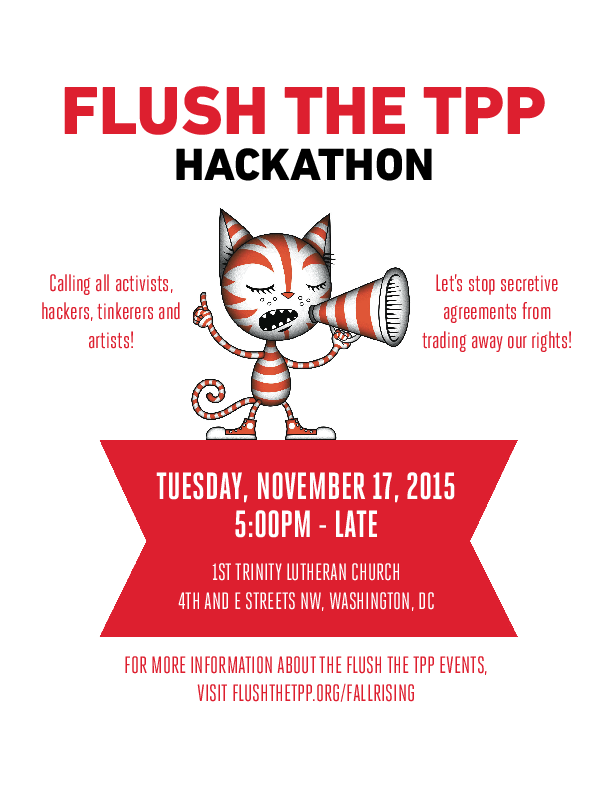 Join us for an evening of hacking, building, and meme-making as part of a week of action against the Trans-Pacific Partnership agreement! At this Tuesday hackathon, we'll be working on making new online tools, resources, and graphics for people to use and spread the word about the threats of the TPP. WHO: Activists, hackers, artists, and tinkerers. Some technical background encouraged but not required. WHO: Techno-activist regulars, and anyone else with an interest in learning more about how the Trans-Pacific Partnership agreement affects the Internet and innovation. This will be a hands-on session, where you can participate in projects being developed in both spaces. TPP Quiz: A way for people to become acquainted with the problems of these deals and help them become better at conveying the threats to their friends and family. Inspect the Text: A tool to highlight portions of the text and how they would affect the public interest, so that people can see what language in the actual text translates to specific regulatory concerns. It could also reveal which industries may have lobbied for or would benefit from this language. Media/Graphic Repository: A platform where all shareable images, videos, and other media can be put in one place for ease of reference and use. Ideally, this would also have share buttons and also have a way to specify usage via Creative Commons licenses. This page was last edited on 17 November 2015, at 04:01.